China's Standardization Administration announced on Wednesday a stricter quality standard for petrol in an effort to bring down pollutant emissions from vehicles. The higher standard marks a step forward in accelerating the use of greener fuel in the world's largest auto market, as vehicle exhausts are blamed as one major factor in worsening air conditions. The new standard, known as "China 5," sets the sulphur content for gasoline at no more than 10 parts per million (ppm), a reduction from the fourth-phase standard of 50 ppm. Starting on Jan. 1, 2018, only petrol of this standard will be supplied nationwide. The announcement comes amid severe smog that has affected large parts of the country since the start of this year and led to public complaints of worsening air pollution. 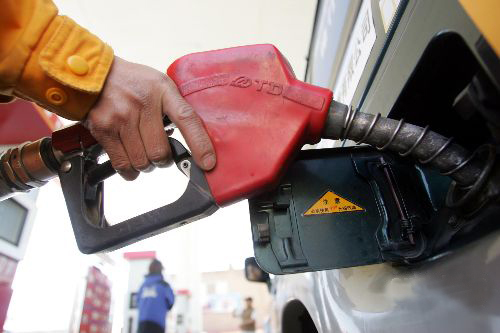 Currently, the capital city Beijing is piloting the strictest petrol standard nationwide, the "Beijing 5" standard, which sets the sulfur content at no more than 10 ppm. In cities including Shanghai, Guangzhou and Shenzhen, the "China 4" standard is applied, while in most regions, the "China 3" standard (no more than 150 ppm) is still the mainstream. According to government data, one-fifth of particulate matter smaller than 2.5 micrometers (PM2.5) in the country's air comes from vehicle emissions. The reading of PM2.5 is a major reflection of the air pollution level. Under the new standard, the content of manganese, a harmful element for human health, will be reduced to 2 mg/L from 8 mg/L; the level of alkene content will also be reduced in order to mitigate photochemical smog. Ding Jizhu, director of an industrial standards department under the Standardization Administration, said that the China 5 standard has been made in accordance with emission control standards in Europe. Ding estimated the new standard will cut nitrogen oxide emissions by 300,000 metric tons annually. The standard was issued amid the government's placing of greater emphasis on environmental protection. The State Council, China's cabinet, released an action plan for air pollution treatment in September, setting a timetable for the progressive upgrading of fuel quality across the country through the year 2017. Under the plan, the nation's economically developed regions, including the Yangtze River Delta and Pearl River Delta regions as well as the Beijing-Tianjin-Hebei Province region, will supply China 5 standard fuel before the end of 2015. The action plan has also set clear targets for the reduction of airborne particulate matter in these regions. China's Standardization Administration announced on Wednesday a stricter quality standard for gasoline to reduce vehicle emissions.